What I will say is that the journey was a long one. This was no surprise, considering just how far away Japan is from Norway and the lack of direct flights between the two countries. 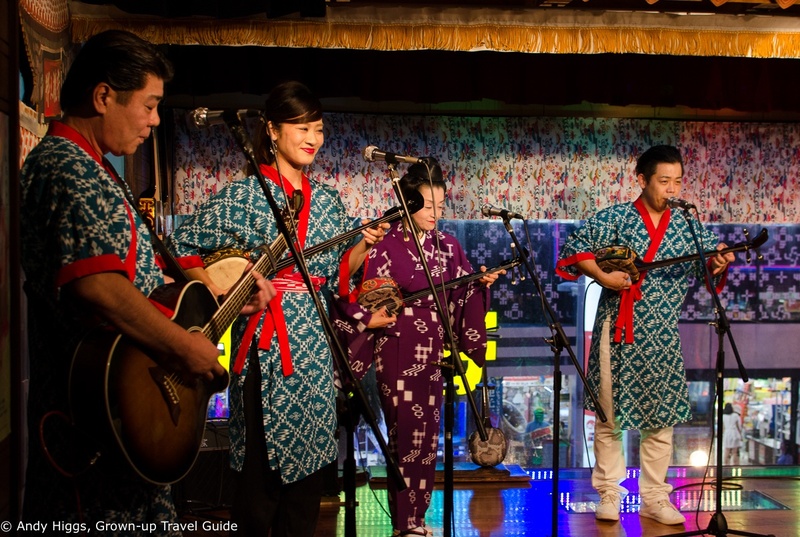 It may seem odd to fly to the Netherlands first but it’s no worse than having to go via Copenhagen, the closest airport with a non-stop connection to Tokyo and a direct flight from Trondheim. The only fly in the ointment was the excruciatingly early start. 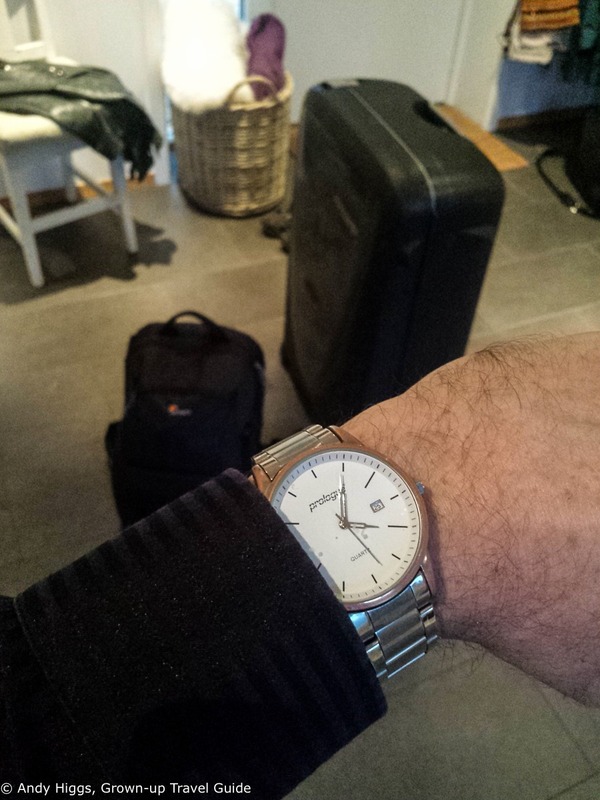 Yes, that watch there is showing you A.M. time as I waited for my taxi at home. With a departure time of 0615, I didn’t have time to sleep as much as I would have liked the ‘night’ before. I know I said there was only one fly in the ointment but there were actually two in there – the other fellow being a six-hour stopover at Schiphol Airport. I managed to endure this by splitting my time between a lounge and an Irish pub; the latter proved a more effective way to pass the time. 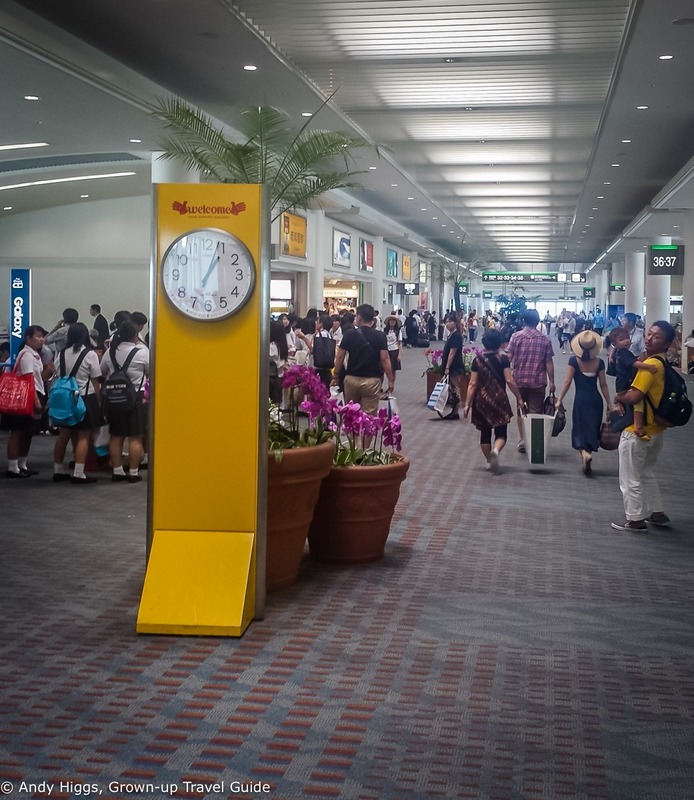 When KLM flight 867 touched down in Osaka at 0830 the next morning I was tired but excited – the immigration process took quite some time and I had to clear my baggage and then check in again for my connecting flight to Okinawa with ANA. It was all a bit of a rush and I only made it to the domestic gate with ten minutes to spare. The weather was glorious as I disembarked; a blast of warmth welcomed passengers stepping out of the plane onto the jet bridge. On entering the terminal building this was replaced by air conditioning and I was struck by how much Naha Airport reminded me of an American one. Not that I have travelled widely in the States, but something about the design and especially the carpet made me think Florida or Washington rather than Okinawa. It didn’t take long for my bags to appear on the belt and after loading them onto a trolley I passed through Customs to find Seiko Kokuba waiting for me. Seiko was to be our guide for the week and with her superb English, excellent local knowledge and great sense of humour – even in the face of rather demanding requests from our group – was the perfect host. Seiko had a taxi waiting and soon we were on our way to our first stop – a restaurant for lunch. Relaxing into my seat I was finally able to start taking in my new environment and enjoying the ‘culture shock’. One of the first Japanese quirks I noticed was to do with the taxi itself – you don’t have to open or close the doors yourself. The driver does this for you, which takes a little getting used to. Turning my attention to the world outside the vehicle, Naha City was clearly a densely-populated place with a lot of traffic. But most of the cars are tiny – Seiko explained that vehicles of less than 660 cc are subject to a favourable road tax rate and are thus extremely popular. Our chosen restaurant was ‘Daikon no hana’, which I am reliably informed means ‘flower of white radish’ in English. Yes, a little more enticing than ‘Burger King’. Anyway, this place is popular with the locals for its excellent value buffet lunch – it’s a simple, laid-back izakaya (tavern) and as such a good place for a slightly apprehensive gaijin to try Japanese food. After a short briefing from Seiko I piled up my plate with some fairly safe choices – beef, noodles, rice etc. How boring, right? For my second trip to the buffet I asked Seiko to accompany me and point out what I should really be trying. I then loaded my tray with a bowl of Miso soup and a plate containing all manner of exotic fare – including seaweed, raw egg and pigs ears, which I felt I just had to try. Very chewy and not something I’d jump at the chance to eat again, but interesting indeed. My chopstick technique – never great, at the best of time – was put to the test and it was clear that I would need some serious practice. But I was obviously going to get that during the next week (cutlery was never offered, not that I would have accepted it anyway) and I managed to complete a very tasty meal without leaving with half of it down my shirt. Now it was time for a drink. Next on the agenda was a visit to the Chuko Distillery. 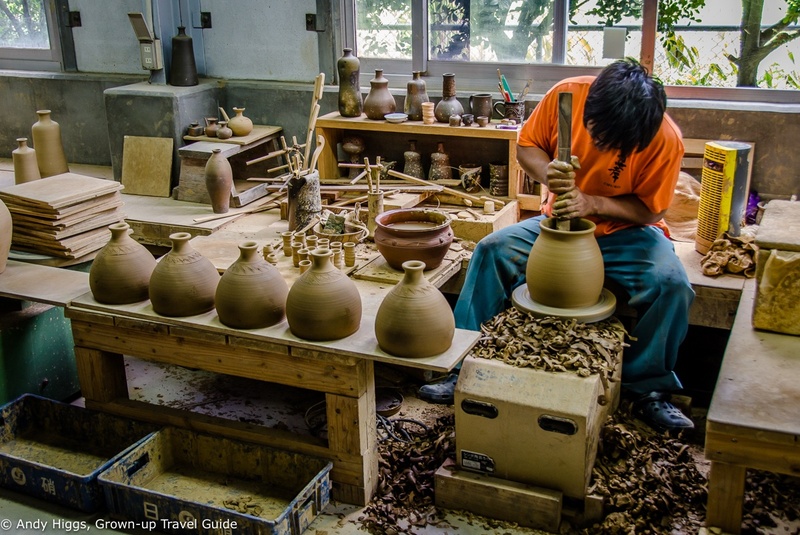 Unique to Okinawa, awamori is made by adding ‘kuro koji’ mould to steamed rice. 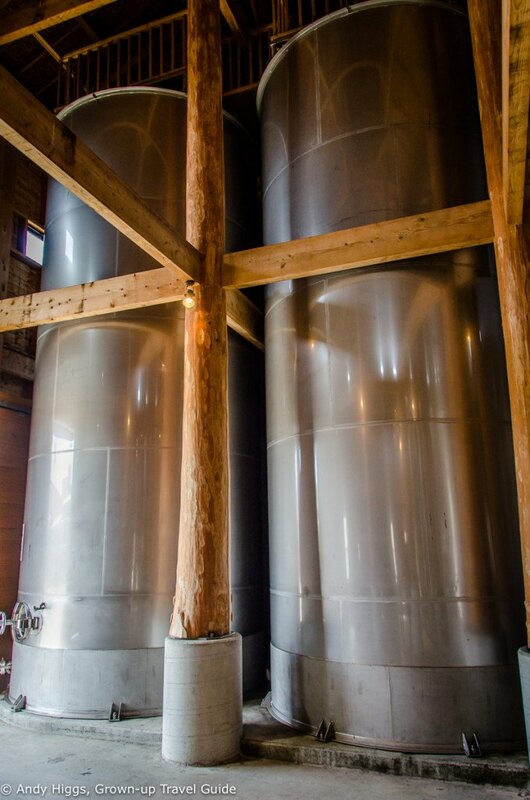 This creates a mash known as ‘moromi’ which is left to ferment for 3 weeks and then distilled. This only produces a small amount of liquor is is not a particularly profitable process; however the magic comes with time. If left to age for more than 3 years, this type of awamori is known as ‘case’ and becomes richer and more mellow. 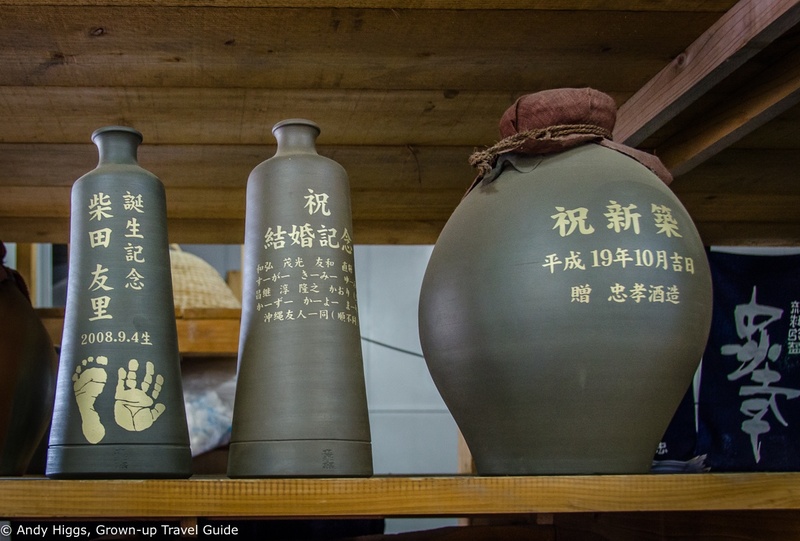 Awamori is the only spirit in Japan that is aged in this way – and as the folks at Chuko Distillery will tell you, it should be stored in vitrified pots like the ones made on site. Visitors to the distillery will be greeted by a variety of such pots in the lobby area, where a DVD presentation explains the entire process. 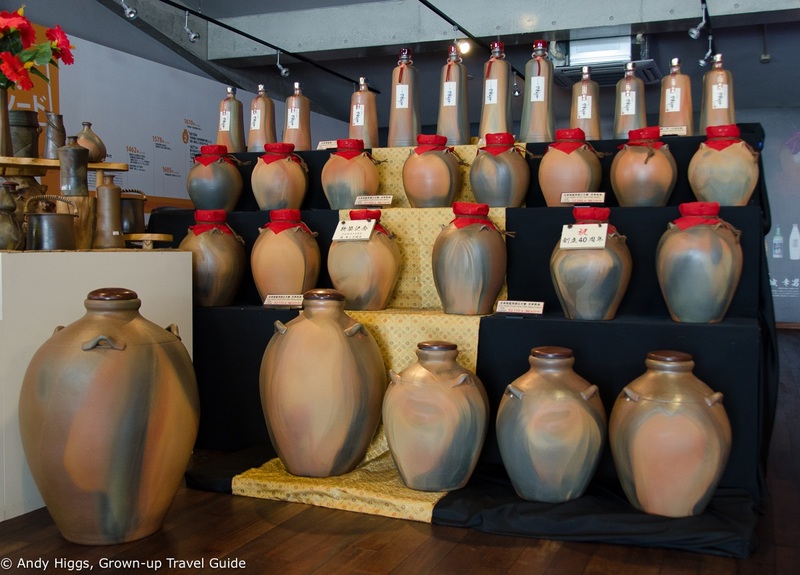 Many Japanese (and some foreign) customers have pots made and engraved for special occasions; these are then filled with awamori and stored for collection five or more years later. 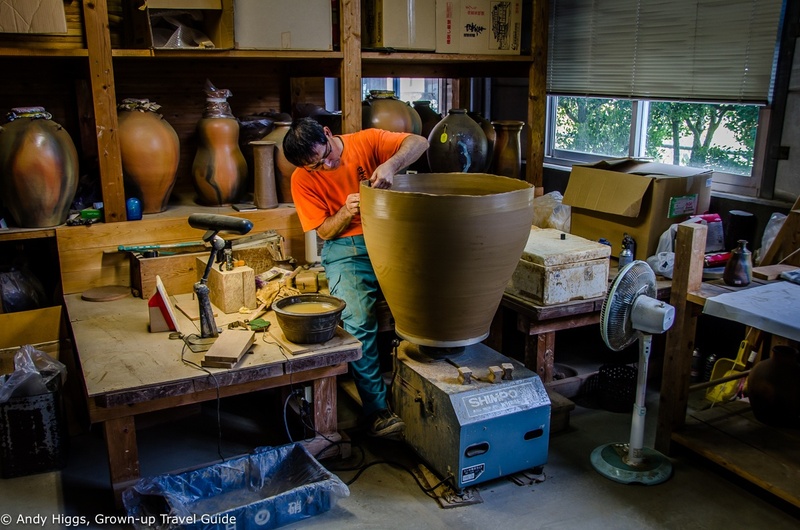 We visited the potters at work – I’m always amazed how easy they make this kind of work appear. Pots come in all shapes and sizes – including huge. 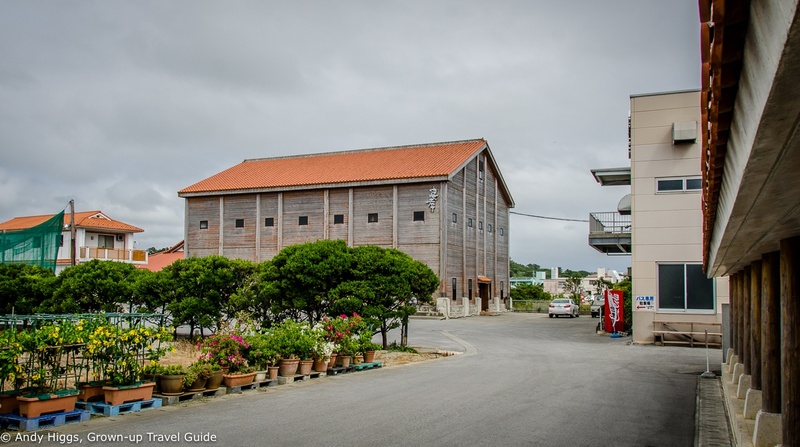 The awamori storage warehouse is in fact the largest wooden structure on Okinawa’s main island. Considering that it houses a number of 50,000 litre tanks, it needs to be. Here you can see the rows of pots labelled with the purchaser’s name and earliest collection date – most of these here won’t be going anywhere for at least four more years. After learning all about the production of awamori, the time had come for a tasting. I liked it a lot – it’s strong but not excessively so; the alcohol content is far lower than vodka, for example. What appealed was the variety of flavours – Chuko has many, many varieties including blended versions. I can definitely appreciate that over time it is easy to be as passionate about awamori as some people are over whisky. As for me, I preferred it neat over ice or mixed with a little water. It was a little early in the day for spirits but fortunately it didn’t go to my head. At least not too much. 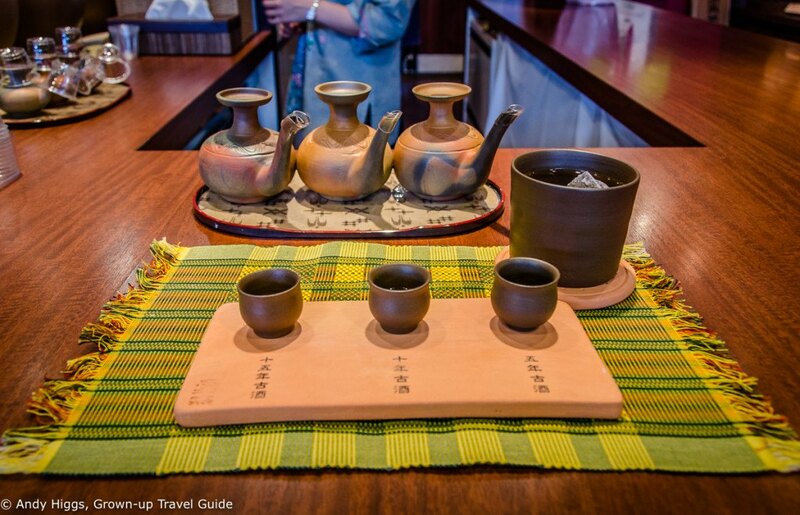 The Chuko distillery is very interesting and well worth a look – admission and tasting are free of charge, too. There is no English website as yet but don’t let that stop you. 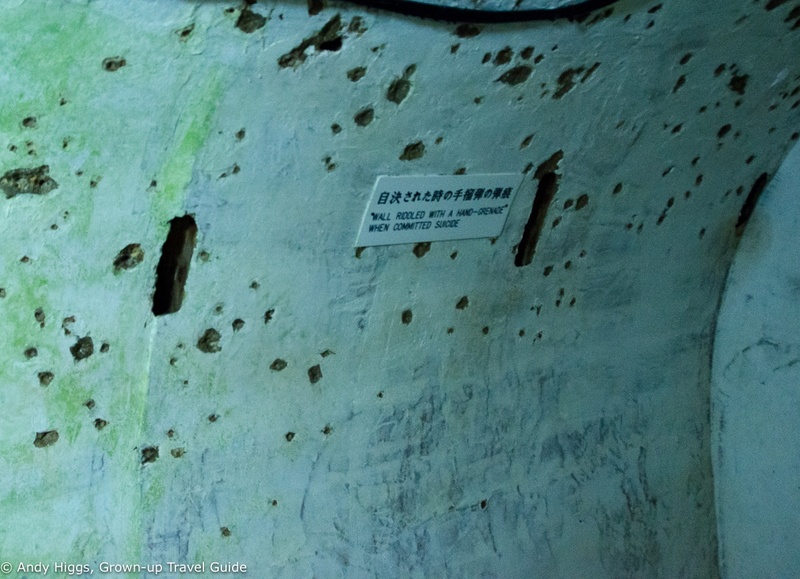 Thirst duly slaked, we left the distillery to visit a site from Okinawa’s recent and tragic past. Before collecting our tickets we took in the view from the car park over the city. 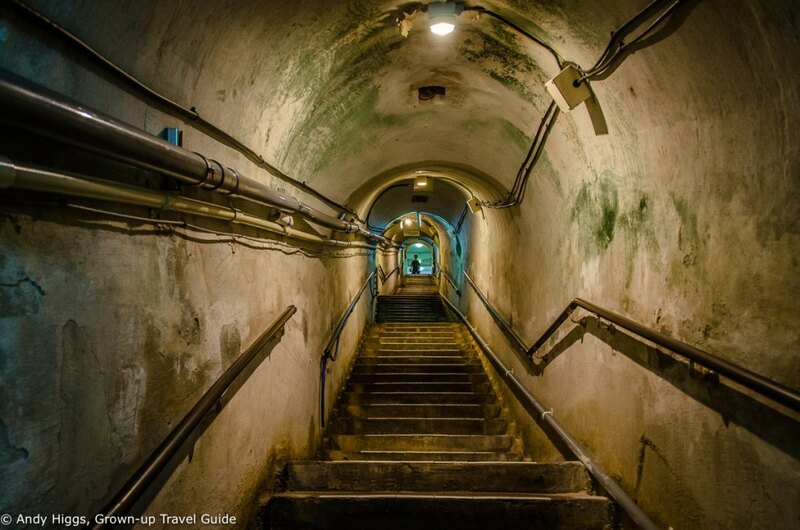 During the second world war an underground complex was dug for the Japanese Navy’s Okinawa headquarters. Completed in 1944, a total of 450 metres of semi-circular tunnels reinforced by wooden posts and concrete were capable of sheltering 4000 soldiers during the American bombardment and the sustained battle for the island. 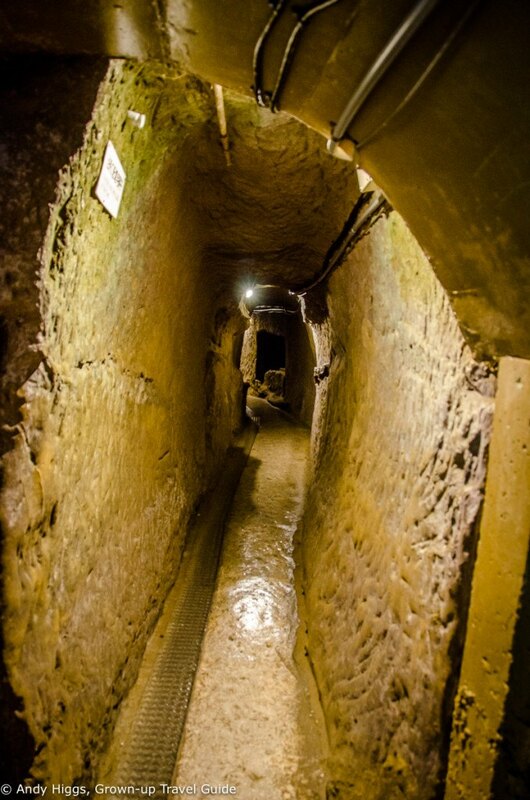 The bunker was left untouched for many years after the war until a 300 metre section was renovated and opened to the public in 1970 to serve as a reminder of the horrors of the time. Damage to the wall in one of the rooms caused by suicide by hand grenade. Before the tunnels were rebuilt the remains of those who lost their lives here had to be collected first – around 2400 were found. The exhibits here underline the sheer scale of the losses suffered by all parties in the Battle of Okinawa: a total of 200,656 people died, 188,136 of whom were Japanese. America lost 12,520 and a shocking 37,139 non-fighting civilians were killed. The bunker is a sobering reminder of the horrors of war and the value of peace – I highly recommend a visit. Back in the taxi, we headed for the hotel where I would be staying for the first night. 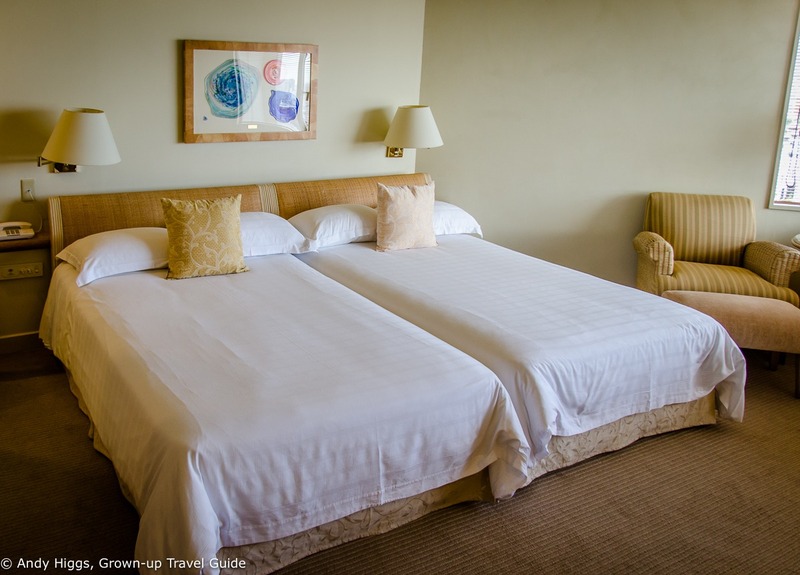 The Naha Terrace is a luxurious hotel in Naha City and my favourite of the places we stayed on this short trip. It was a pity we only had one night here but hotels in Naha were running at capacity and we had to stay at two different establishments as nowhere was available for both nights. 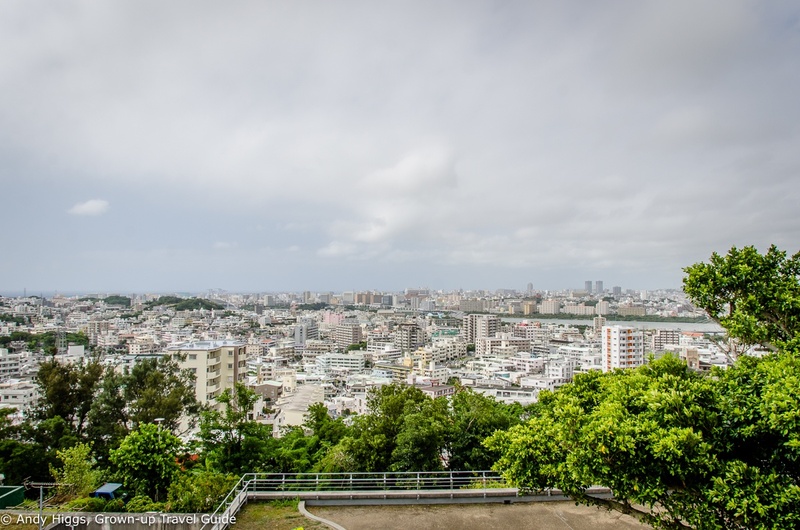 As you can see, the Naha Terrace offers accommodation of a high standard and if I were booking myself it would definitely be the first place I would check for availability in the city. Special mention must be made of the toilet. 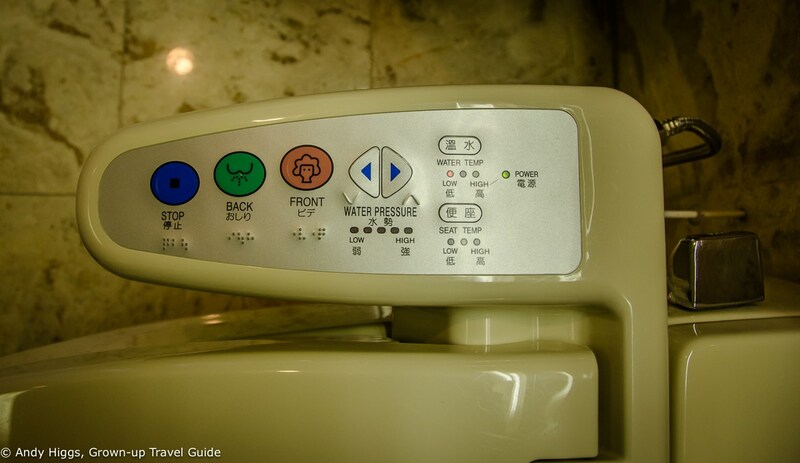 The one in my bathroom was not and unusual or fancy model by Japanese standards, but it was my first encounter with a legendary ‘super-toilet’. Best of all, it had English labels as well as fairly descriptive icons to demonstrate what the buttons do. Combining a bidet and a toilet in one neat package, I’ll spare you a detailed description of the experience but I can see how you could get used to it. With just an hour before meeting the rest of the group (who had arrived at different times) in the lobby downstairs I unpacked what I needed and took a quick shower. It turned out that the three other participants were delayed so I took the opportunity to have a cold beer in the hotel bar. I toyed with the idea of sipping it by the pool but it was a bit too warm and sticky outside. The humidity in Okinawa is a little fierce at this time of the year and the fan is your friend. Or the air conditioner, its modern yet inferior sibling. I returned to the Naha Terrace lobby just as Seiko was introducing herself to the others: Stefania from Italy, Pascal and Pierre from France. We bundled into the waiting minibus and headed for the main drag in Naha City, Kosubai Street. We got to know each other a little better on the way to the venue for dinner but the ice was truly broken after we sat down for our meal and had time to talk. 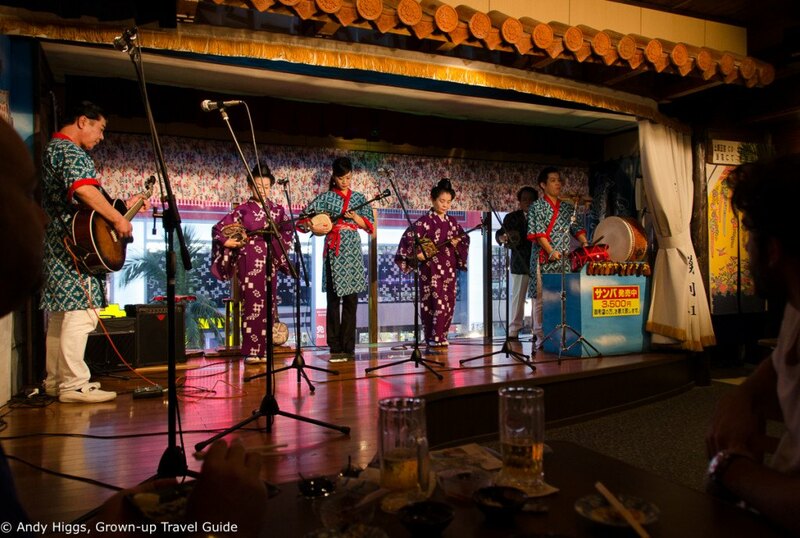 A very popular establishment, Na-kuni offers dining with live music from some of Okinawa’s most respected musicians. As we had all arrived on long-haul flights the sensible thing would have been to have an early night. 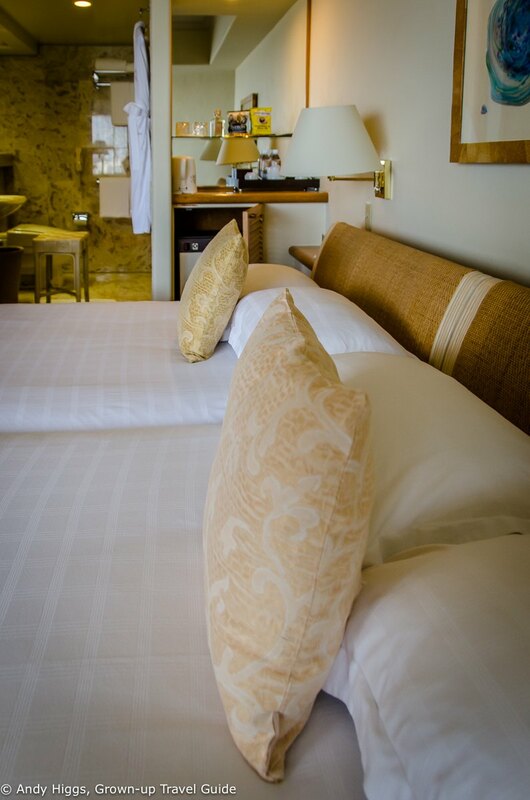 Miraculously, that is in fact what we did, returning to the hotel to catch up on some much-needed sleep.